The HP 4500 & 4550 are built for high volume work, sturdy and reliable. They use four SubToner cartridges - Cyan, Magenta, Yellow and Black. It uses a parallel port and a “mini-centronics” cable. The package includes the printer, power cord, driver and service manual on CD. Options are available Mini-centronics cables are available for an additional $30, and USB adapters are also available. Network cards can be installed for about $50, which will enable use with Mac systems. Cost of shipping is not included in these prices and will vary by location. Typically, freight cost to a business in the eastern and central US is approximately $150. Shipping to the west coast may run $180. Call or email with your location to determine shipping costs. Shipping to a residence costs an additional $50. 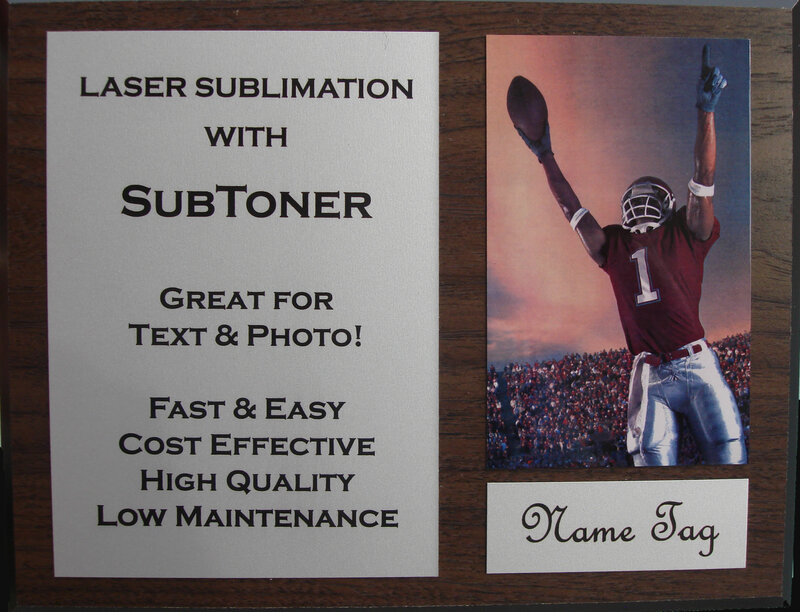 dramatically improved the sublimation toners for it. Most sublimation toners for the 4500 have a yellow which is too strong in comparison with the other colors. The result is that a “fire engine red” is impossible to achieve, “tomato soup red” is as close as they can achieve. Their instructions ask you to calibrate the yellow to –5, and still it’s too strong. And our toners are really excellent. We wanted our sublimated images to closely resemble the same images on the computer screen, without adjustments in the program or on the printer. But there are so many variables in monitors, in computer programs, in color management setups and color profiles that we can’t predict how any color will really look on anyone else’s computer screen. So we calibrated our toners to closely resemble the output of the printer itself. An HP 4500 or 4550 will generate some interesting display pages, with or without a computer attached, which demonstrate how good a sublimation toner really is. We formulated SubToner to closely resemble the printed page output of a configuration page. Comparing the sublimated configuration page on white metal against the printed page with conventional toners. We originally formulated our toners to operate best at printer calibrations of K = 0, C = 0, M = 0, Y = 0, but we found greater versatility with a slightly stronger black which could stand alone at K =0, or work well with the other the colors at K = -2.